According to Gerry McGovern, and reported by AutoCar, the Land Rover design director has told them that the new second-generation 2014 Range Rover Sport will have a new look and “much greater visual differentiation” from the standard Range Rover. McGovern was quoted as saying the new car “would be given more personality than before” and it would be “separated a bit more” from the standard Range Rover. Like its big brother Range Rover, it shares Land Rover’s new Premium Lightweight Architecture (PLA), which features a riveted and bonded aluminum monocoque that shaves over 600 pounds off the curb weight bringing the Sport to 4762 lbs. Reports say that a new four-cylinder option is under evaluation and could be offered on the Range Rover Sport for the first time. The new 2014 Range Rover Sport styling could resemble that of the new popular 2013 Range Rover Evoque that has a sharply raked roofline, shorter rear overhang, deeper body sides and more aggressive treatment for the front and rear of the vehicle. The Evoque has been wildly popular around the globe, and Land Rover may be thinking about extending the design to include the new second-generation Sport. Engine options on the new 2014 Range Rover Sport in Europe will likely include a 255 hp V6 diesel as the entry-level unit, and a 334 hp twin-turbo V8 as the most potent oil-burner. A Jaguar-sourced 510 hp and 461 lb ft of torque V8 gasoline engine is likely for the Supercharged variant here in the U.S. There could also be a V6 diesel-electric hybrid, which should have a claimed combined 333 bhp, a 0-62mph time of 7.4sec and CO2 emissions of just 169g/km. We reported here earlier this month that the 2013 Range Rover Sport will feature two new Limited Edition models for the 2013 Range Rover Sport and Range Rover Sport Supercharged models.The Supercharged Limited Edition and GT Limited Edition will be available for the first time in limited numbers. 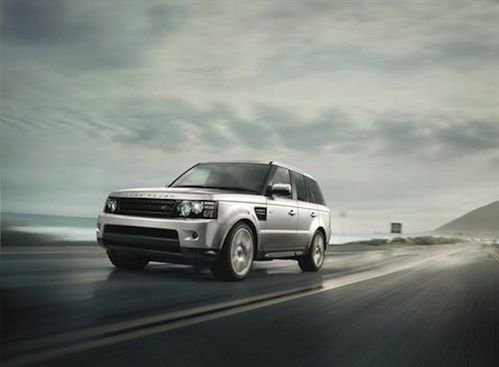 The 2013 Range Rover Sport Supercharged Limited Edition will be offered in the the U.S. and will feature a combination of new luxurious interior appointments and exterior design changes that will differentiate it over the standard Supercharged model. There will only be 300 units being produced in Santorini Black, and 200 units in Fuji White for the 2013 Supercharged Limited Edition. We're not sure if the Limited Edition models will be carried over to the new 2014 Range Rover Sport. The newly-designed 2014 Range Rover Sport is due to be revealed in the middle of 2013 before going on sale at the end of the year.